Ordinarily I would not recommend doing this, but of course it is up to the individual and the circumstances. I would like to showcase an example and let the reader make their own decisions as to whether or not they should perform something similar to their quilt. I happened to have a quilt made by my great grandmother that I had appraised last year. It turned out to be valued low due to condition issues, mostly water and age stains, as well as a funny smell and a dingy fade to the overall quilt. So I figured if I washed it and it didn’t turn out so well, I wouldn’t have lost much. I mean, it is an invaluable heirloom to me, but I do have 6 or 7 other quilts of hers to cherish. So I decided to test this product I’d recently heard of called Retro Clean. 1. 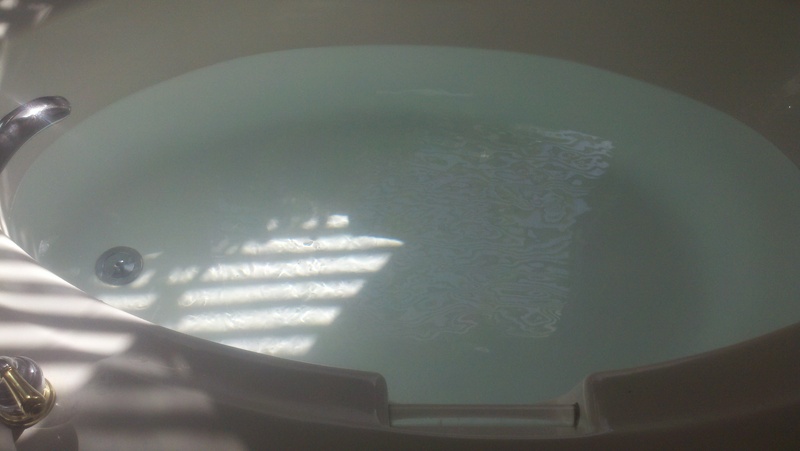 Filled the bathtub with lukewarm water and let it sit for 20 minutes (to let the chlorine evaporate). 2. 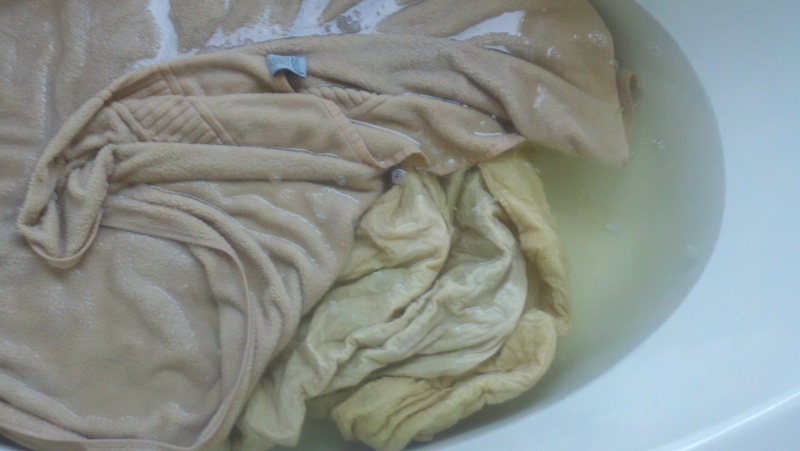 Place the quilt gently into the tub, pushing it down into the water to ensure the water penetrates the fibers. 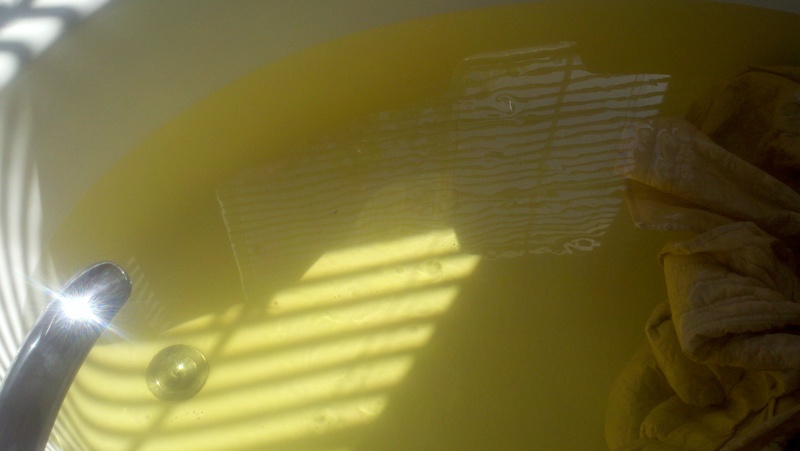 At this point my bathwater turned very yellow, which indicated to me that I was already making progress. So I removed the tub drain to let the water out. 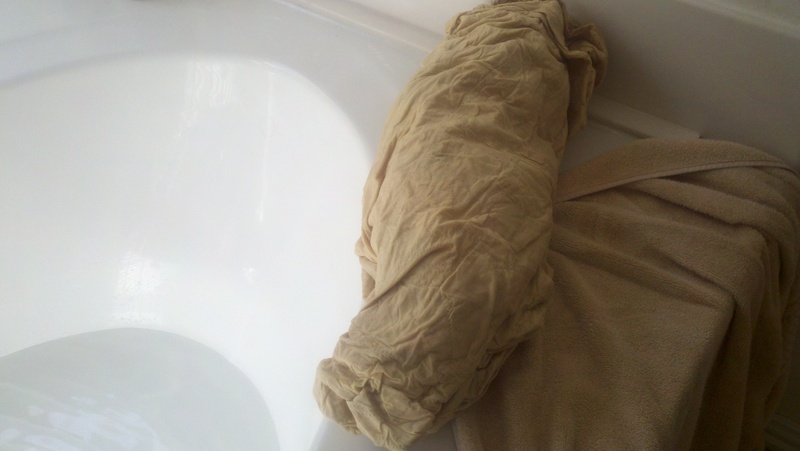 I lightly folded up the quilt so I could push a bit more water out of it, once it had drained from the tub and removed the quilt to the edge of the tub. 3. Refill the bathtub with lukewarm water and let it sit for another 20 minutes. Resubmerge the quilt and gently move it around in the water. Again my water turned yellow, so again I drained it, and repeated the process again. 4. Moving along… Fill the tub, add the sample size pouch of Retro Clean and let it sit for 20 minutes. Submerge quilt. The directions state that the quilt needs to be completely submerged in the water for 2 days, preferrably in the sunlight. Well, I couldn’t get every bit of the quilt to stay under water without a towel laid over it, so that’s what I did. I let it sit for 2 days. 5. Drain the water. Now comes the toughest part. Removing the quilt from the water without damaging any of the fragile fibers is the most concerning step of the process. So I used the towel to encase the quilt and brought it outside. I used a white sheet to cover the trampoline out back and put the quilt over it. It was dry the next morning. As you can see from the pictures, I had fantastic results in this case. My quilt was in very good condition (only one small tear), being assembled in the 1920’s. Quilts from earlier periods may have material or thread that have migrating dyes or cuastic mordants, causing color bleed and material disintegration. To prevent these issues from occurring, you MUST ensure your quilt will react positively to a water bath PRIOR to placing it in one. The best test you can perform is to test a very small section of the fabric in each color with the water in advance. Or consult a conservation specialist. So consider this a product review. If you DO make the decision to bathe your quilt, I would recommend using ORVUS soap or RETRO CLEAN. But before you take action, be absolutely sure you want to take this step.